The swirl of war in Europe and conflict in Asia confirmed the wisdom of the decision to remilitarize Alaska. In 1940 Germany invaded France, and Japan occupied French Indo-China (Vietnam), and later the Dutch West Indies. The Germans soon conquered Paris and the north of France, forcing the evacuation of 338,000 British and French troops from Dunkirk on the French coast across the Channel to England. Already in 1939 the U.S. Congress had removed its prohibition of arms shipments to belligerents, and in 1940 approved the "lend-lease" program. To direct the Alaskan theater, the Army created a new command, the Alaska Defense Command, to the head of which it appointed Brig. Gen. Simon Bolivar Buckner, while the Navy established the North Pacific Force, commanded by Rear Adm. Robert A. Theobold. At the same time, the Army formed a new air arm, the 11th Air Force, led by Brig. General William O. Butler. In addition, the War Department authorized formation of an Alaska Territorial Guard, which was divided into two districts: western and eastern Alaska. Most of the units in the western division were Eskimo Scout groups organized in villages by a former World War I troop transport division officer, Maj. Marvin R. "Muktuk" Marston. This was the state of Alaska's defenses when the Japanese attack on Pearl Harbor drew the United States into the war. Courtesy of the National Archives, Washington, D.C. While the attack on Pearl Harbor on December 7, 1941, shocked most Americans, it inspired terror in Alaska. Acting with cautionary prudence, the U.S. military did not inform Alaska civilians of the level of danger to the territory. No one knew if Alaska might also be targeted, particularly the southern ports of Ketchikan, Sitka and Juneau. Such anxiety had been partly self-generated by pre-war arguments by Alaska's lone delegate to Congress, Anthony Dimond, who had argued that fortification of Hawaii without the militarization of Alaska amounted to defending one door to America while leaving another one wide open. Alaskans had grown accustomed to thinking of the territory as an American Pacific bastion. The pace and magnitude of military construction in 1940 and 1941 reinforced such perceptions. Reports in Tokyo that Japanese air raids had killed 3,000 in Fairbanks exacerbated the rumors and accompanying fears. So, too, did Buckner's order rotating military dependents out of the territory as soon as transportation could be arranged. Alaska went on a war footing immediately. Buckner ordered all defenses strengthened, and construction accelerated on all projects underway. Seward, the principal transportation entrepot, became a beehive of defensive and anticipatory activity. At the same time, the military withdrew about 25 percent of Alaska's land area for the war effort. Part of that effort involved the "lend-lease" program. Tons of supplies were to be moved to Russia from the United States. The U.S. committed hundreds of ships and submarines to protect the shipping lane along the Canadian and Alaskan west coasts. At the same time, aircraft provided to the Soviets were flown along an air route from Great Falls, Montana, across the Canadian west to Fort St. John, Fort Nelson, Watson Lake and Whitehorse, and across Alaska from Northway to Tanacross and Big Delta to Fairbanks where they were transferred to Russian pilots who flew them to Nome, then across Bering Strait to Siberia, and thence across the Siberian steppes to European Russia. Also brought in were tens of thousands of Quonset huts. It is difficult to imagine World War II in Alaska without the Quonset hut. As tens of thousands of military troops and civilian workers flooded into the territory beginning in 1940, there was simply no housing for such a population. Housing was needed for workers during construction, for Army and Navy personnel who needed quick, temporary structures, and for quasi-permanent facilities on most of the three hundred military installations established in the territory during the war. Quonsets were ubiquitous in Alaska during World War II. They appeared virtually everywhere troops were stationed, which was throughout the territory. One estimate suggests that between 20,000 and 30,000 of the huts were shipped to Alaska, a number probably impossible to verify, but also probably correct. Their use can be documented in nearly all bases, including Ft. Ray at Sitka, at the Ketchikan naval facility (Annette Island), at Yakutat, at Kodiak and Cold Bay, on Adak and most of the other Aleutian Islands. 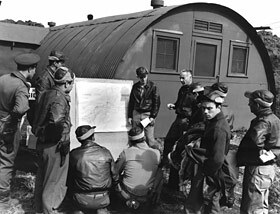 Several hundred Quonset and Pacific huts were used on Attu for housing, for library and medical facilities, storage, mechanical work and the post office. The same was true across the territory. The first units probably came to the territory soon after the attack on Pearl Harbor, when the Corps of Engineers ordered 16,000 for Alaska. Many went to secret new bases at Umnak Island and Cold Bay; their shipping labels read "Blair Packing Company" and "Saxton Canneries". Later, others went to Cordova, Juneau, Port Heiden, Amchitka, Kiska, Shemya, and Nome. Thousands were sent to Anchorage, the headquarters of the Alaska Defense Command and all Army deployment in the region.